At Deep Creek Lake Wisp Resort there is an area of zip lines and challenges. 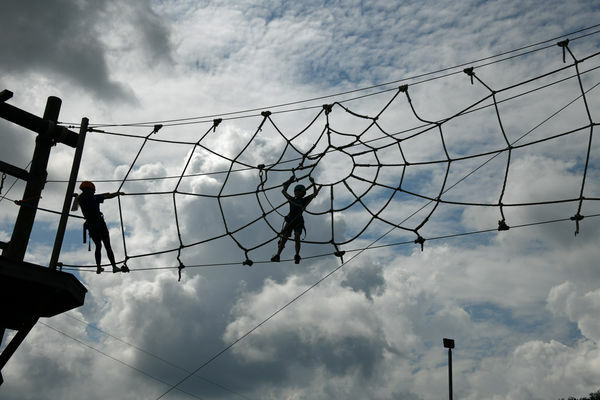 This scene of a young boy crossing the spider web created a neat silhouette image. Hope they have really, really great liability insurance. Looks cool for kids not for me I'm no spider man. Thats taking advantage of a good sky. I think you have some good compositions within this. Very nice silhouette. love the silhouettes, ike...fun walk for the kids. Better him than me, tethered or not! Nice silhouette. Nice shot. Great sky. Might have more impact if cropped closer to the web. Like others would like to try it if only a few years younger. It sure did, Ike! You have a good eye! Man, I'd never try anything like that!